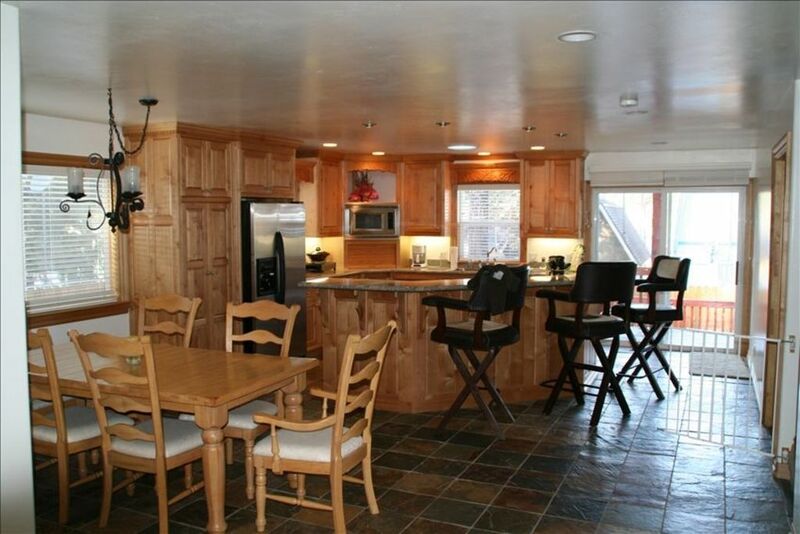 This spacious 2600 sq home is located in Moonridge area in Big Bear Lake, California. It was built in 2005 and sits hidden under 200 ft pine trees, the home is less then a mile walking distance to the golf course and ski resorts. The home is so complete that it can accommodate any type of individual whether it be relaxing by the wood burning fire or if you choose to entertain the house is equipped with two 50 inch HDMI TV's, two surround sound stereo systems, wireless internet, DVR and two comfortable family rooms. Also, the home is completely baby proofed with locks on cabinets as well as gates throughout. It has a full bar, two full size refrigerators, wine chiller and an eight person Jacuzzi on the private back deck. This home/cabin is a wonderful place for a family of twelve or less or for those looking for that romantic getaway.P.S Please review the calendar and make sure your dates are available before inquiring! !For those family that are needing more space, I have a 2 bedroom across the street, also this house is NOT DOG FRIENDLY, due to children with allergies. 50.00 fee for spa access. Its vary quite and comfortable, and it offers all the latest upgrades. Great home to spread out in with adults and kids. Kitchen had everything we needed!!! Well kept property....very close to slopes. Had great family time on this home! Thank you Gary! Kim and family, glad you guys had a great time. Yes I would open my cabin to these guests again. My family, friends and I really enjoyed the cabin. The owner was so helpful and it made it a lot easier of a stay. There is only one thing to warn about is the oven door slams open everything else was really comforting. I’m so glad you guys had a great time and even got to wake up to fresh snow. Please keep my info for the future. Baby Proof Cabin was Great! We had a wonderful weekend in Gary's Cabin. 6 children and 6 adults. Everyone loved the layout with places to keep everyone happy. But especially the children, ages 10 and under. Amazing property. Everything you could ask for. We came to the Parkers cabin for Thanksgiving! My family and I enjoyed our stay so much. This property is beautiful and has everything you could possibly need. I’m glad you guys had a great vacation and good weather! Please keep my info for the future and I also have a a few places in San Diego on the beach! Although this is basically a nice cabin there were several issues that did not live up to my expectations. Picked this cabin as it offered a spa and is supposed to be babyproof. Found out after we arrived that there was an additional $50 charge to use the spa. The control panel on the spa didn't work correctly. The majority of the baby locks in the kitchen and bathroom were broken. The kitchen although big and attractive was understocked, missing some of the basic necessities. The owner made our trip less enjoyable as he called me almost dozen times over our short stay. As the owner/builder of this wonderful property that has averaged nothing but 5 star reviews over the last 15yr it’s true to state that in general you can’t always please everyone and now I got 1 reservation with a one sided oppenion that slanders my family retreat! Sad to say my hot tub got disrespected with some sharp tool used on the control panal while these guest were here and I had to file a damage claim, but to mention who leaves soda cans in the freezer when they check out! Only to have to defrost he freezer to clean up a big big sticky mess!!!! It only takes 1 couple in a restaurant to leave a negitive review after enjoying a great meal just because there coupon was expired!